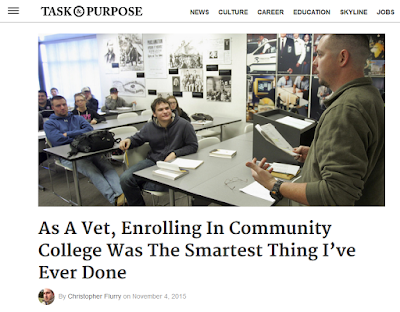 Here's some advice from Marine ‪#‎veteran‬ Christopher Flurry about the benefits of attending community college, which was recently featured in Task & Purpose. Rio Salado, the Maricopa Community Colleges and East Valley Veterans Education Center are ready to help you transition to college life and succeed! Learn more about Rio Salado's Veterans Affairs services at www.riosalado.edu/veteran.